At the very least, it's a very nice looking fan. According to Dyson we spend up to 90% of our time indoors. Personally, I currently feel like I spend 90% of my time indoors, writing about Dyson product announcements, but let's move on. To help us avoid the nightmare scenario of toxins, germs, spores and lurgies shown here, it's created an expanding range of Dyson Pure devices, of which Pure Cool Me is the most recent and most personalised. Dust, allergens, VOCs (Volatile Organic Compounds) and more are gobbled up by this 'personal purifying fan', so your air stays cleaner, and it also pulls double duty as a fan, keeping you cool. Dyson Core Flow tech is the key to this 'personal' approach to air purifying, with a dual air flow running over a convex surface in a device, 'Inspired by the aerodynamic properties in the Harrier Jump Jet.' The dome on top lets you control the angle of this flow, or you can turn on the 70-degree oscillation. The important bit here is that the HEPA filter captures '99.95% of particle pollutants', including, 'pollen, mould spores and bacteria' An activated carbon layer quells 'gases, odours and household fumes such as VOCs.' Particles as small as 0.1 microns can be given a firm talking to by the Pure Cool Me. Acoustic engineering means it shouldn't be too loud, however. 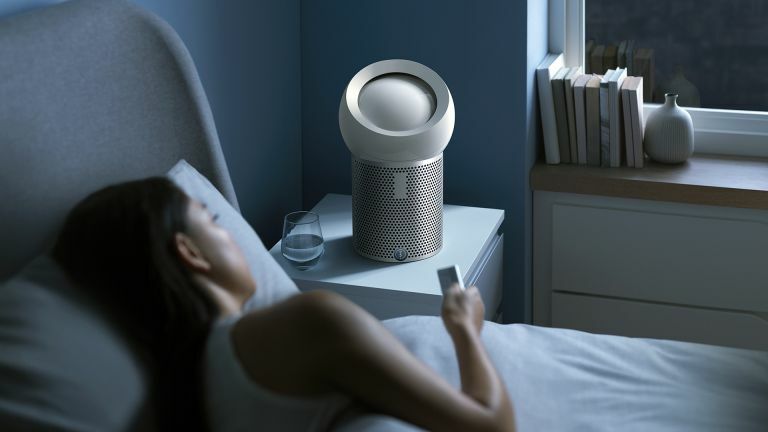 A light sensor automatically dims or brightens the Pure Cool Me's screen to reflect ambient lighting conditions, and will switch it off entirely when in darkness, ie: at night when you're trying to sleep.